The initial quarter was a very low scoring one with Hibs ending it with a minimal margin 9-8 as the two sides were not precise in their offensive attempts. Things did not change much till midway in the second half as Depiro made it a tied game at 14-14 after two respective baskets from Ashley Gray, who had a positive offensive performance, and Nicole Agius. However, Hibs here replied with a strong run. In fact, the Paolites, who were led by veteran coach Tony Camilleri after he replaced Simone Zammit during the week, embarked on a 13-4 run where Amelia Simmons scored some of the baskets whilst there also were treys from Samantha Brincat and Emma Micallef respectively. This positive patch helped Hibs to a 27-18 half-time lead. When play restarted, Depiro made their intentions clear as they immediately reopened the game as they finally found more consistency in their offensive ploys and two Stephanie Demartino long distance shots and further close-range hoops from Gray got them very close to their opponents. Yet, another Hibs run, this time 9-2, with Simmons doing most of the damage, gave the Paolites a five- point margin with one quarter to go, 40-35. The last ten minutes resulted in the highest scoring of the game. Initially Hibs extended their lead to eight points after two Elena Cassar baskets. But Depiro outscored Hibs 11-2 in the next three minutes to even take the lead at 50-49. Here the tandem Gray-Demartino was responsible for these Depiro points. It was all to play for as the game entered in its last 100 seconds. Claire Ciantar made it a momentary a one-point game but at the other end Hibs replied with a Leanne Duncan hoop and two Brincat free throws for 60-55. Gray gave fresh hope to Depiro but with less than half a minute to go, Depiro did not stop the clock and Hibs managed to keep possession and end with a small, but important, two-point margin at the final buzzer. Depiro: No. Agius, G. Mifsud, Ni. Agius 5, D. Agius, S. DeMartino 20, D. Said Hollier, M. Scicluna, N. Hili, C. Ciantar 6, A. Mifsud, A. Gray 27. Hibs: E. Micallef 5, E. Cassar 6, K. Calleja, K. Calleja, S. Brincat 8, I. Agius, J. Abela, S. Abela 12, A. Simmons 22, N. Farrugia, H. Al Tumi, K. Caruana, L. Duncan 7. Referees: I. Simic, N. Azzopardi, D. Torok. 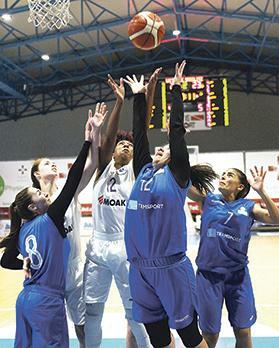 Caffe Moak Luxol made it two wins on the trot when they handed early pacesetters Starlites GIG their first league defeat of the season to blow the women’s title race wide open. When Starlites GIG opened strongly in the last quarter and went 49-39 ahead with seven minutes to go, many believed that the game had taken a decisive twist. But Luxol had other ideas and they came back strongly with an impressive 21-0 run keeping Starlites at bay, without a single point, till the very last moments of the game. The start of the game had Luxol take the first lead as the strong American Alexis Dillard immediately made her presence felt. But Starlites overturned the score in the latter part of the first quarter with an 11-2 run inspired by their leader Patricia Arguello and also a trey from Michela Zammit Cordina. The second quarter was a low scoring affair. Luxol tied the score twice but late points from Zammit Cordina and Maria Bonett helped Starlites to a slender three-point advantage at the interval, 24-21. There were three respective positive moments in the third quarter. First it was Luxol who returned to play in a livelier fashion after the break as Ina Baena, Monique Caruana and Sarah Pace assisted Dillard as they moved to a small lead. Then it was Starlites who momentarily found their mark as treys from Kristy Galea and Arguello led them to a 41-33 advantage. Luxol then closed off the quarter with a good spurt and moved to just a single hoop away, 39-41, with one quarter to play. Play restarted and Starlites notched eight straight points to register a double-digit lead at 49-39. However, they remained on the 49-point mark for more than six minutes as Luxol hit back in a decisive way with a 21-0 run. Pace started off with a trey and then notched some more hoops, including another long distance shot whilst Dillard continued with her play under the boards. There were also points from Antoinette Borg and a trey from Caruana as Luxol stunned their opponents and assured themselves of the win. Luxol: S. Pace 13, M. Caruana 8, Ni. Vella, I. Baena 12, K. Portelli 2, A. Borg 3, A. Dillard 20, L. Caruana Montaldo, C. Mifsud 2. Starlites: M. Zammit Cordina 10, K. Galea 11, A. Micallef 2, S. Farrugia 2, M. Bonett 9, H. Acreman, M. Riolo, J. Grima 6, P. Arguello 12, M. Cutajar, S. Davies, F. Fabok. Referees: T. Mantere, I. Simic, N. Xuereb. Standings: Starlites GIG (3-1) 7; Hibernians (3-1) 7; Luxol (2-2) 6; Depiro (0-4) 4.